I'm working with a high school that's doing Scaramouche. I need to find some smallswords that are usable for stage combat. Due to a limited budget, I'm looking for something that isn't necessarily a perfect replica (like the beautiful $400.+ models I covet myself) but something that's strong and usable, and looks close enough to pass for a small sword. Any manufacturers out there have an "econo" model for school use? Pay no attention to insignificant movements of the sword. It depends how inexpensive you mean when you say "econo"
Thanks. The Warrior ones are more what would work. I have one of the old Armoury ones. Like many of those I've used at various theatre schools, the knuckle guards snap off them very easily, and they tarnish so quickly. The steel type from Zen looks pretty reasonable. I'll need to find the right blade, as a foil blade won't do for stage. 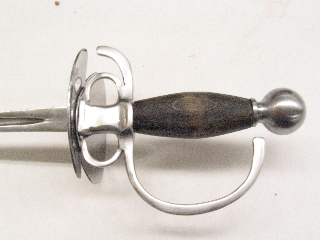 The trouble with most rentals is that the swords are cheap with pot metal hilts that tend to break as you mentioned. For the price it looks more like a "real" smallsword than most, and won't break like the American Fencers' manganese bronze ones. I believe all ZWA hilt parts are stainless steel. I've only handled his broadswords, which were simple but clean and well put together. I have a quick question. Would any of the blades at Zen Warrior Armoury be able to take an edge at all? Or are they more like epee blades for fencing with a triangular cross section? I'm looking for something like a thrusting bade that could hold an edge if desired, and I really like the look and price of their weapons. Unfortunately, I can't seem to find any pictures of their blades, so I'm at a loss here. Maybe something with a flattened diamond cross section? I would check out KOA. they have a selection of stage combat weapons, and they are known for their customer service. I'm sure you could call and ask about the quality of any of the products you see and they would be glad to answer you honestly. They have some schlager blades, but I don't think you could put an effective edge on one of them. To know for sure, call or email them. Since they make swords for bouting and stage combat, it is unlikely that they have the kind of blade you are looking for. Schlager might actually work, I'm not looking for something to cut with, just something that looks more accurate and could have an edge, or at least could look like it had an edge. I'm in the market now and I might just add one of these weapons to my collection. Thanks for the information!